13 startups from the European tech hubs in Berlin, Barcelona, London, Copenhagen and Tel Aviv just started the second round of the EU accelerator programme EuropeanPioneers which is led by the Berlin based company builder etventure. 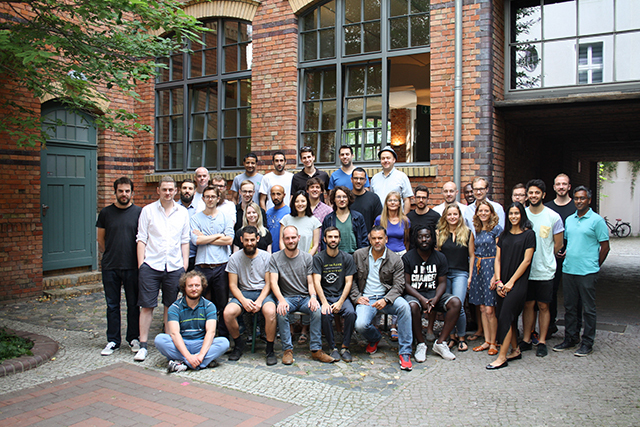 All teams arrived in Berlin for the 3 day “welcome days” (11-13 of August 2015) where the startups are introduced to lean startup and design thinking methodologies. Throughout, the startups also meet their coaches and mentors, representatives from the largest German venture capitalists, such as High-Tech Gründerfonds, hub:raum, Techstars METRO Group and many other key players in the start-up scene. The mentioned introductions will help the teams in the coming 8 months with concept and business model development, milestone planning, user testing, team building, marketing and financial support. A total of 2,275 Million Euro will be distributed over 13 teams. Every startup will receive 175.000 Euro in funding. Since the funding is public money provided by the European Union, startups do not need to give up equity in return. The startups were carefully selected out of 660 applications received from 45 European countries out of which 40 startups pitched in front of an expert jury. Laura Kohler, Head of Accelerator at EuropeanPioneers remarks: n“Out of 660 we chose 13 extremely promising startups. The quality of the teams chosen for the second round is exceptionally high. All teams have either been part of other accelerator programmes, have a trusted list of customers and cooperations or have nthe support of renowned and successful representatives in their industries. In addition, I am pleased that we have an almost equal ratio of male and female founders in this batch. 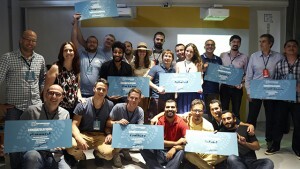 Our accelerator sets itself apart from the other FIWARE acceleration programmes as we have the highest investment amounts and will be holding our “training weeks” in 3 different cities including Tel Aviv, London and Berlin.” nThe startups in this round are focused in the business areas of Smart City, Media & Content and Social & Learning. BEACONinside is a vendor-agnostic iBeacon and Eddystone-beacon management platform provider to enable enterprise customers to set up largescale beacon solutions in days, not months. BEACONinside is already present in German franchises of McDonalds, works with Deutsche Bahn as well as with retail chains such as Esprit. The virtual reality startup Viorama has developed a mobile app, that allows to view and visualise spaces in a 360 degree sphere. One use case of the app is to greatly benefit the travel industry. Founder Michel Ronen who is originally from Israel, moved to Berlin ten years ago to pursue his career one of which happened to be film directing. INFARM is a Berlin based startup that developed a game changing technology to shape the future of city farming which allows their private and business customers to grow edible plants and greenery all year long. INFARM has gained mass media attention and designed custom growing systems for clients like Airbnb, Mercedes-Benz, the 25h-Hotels, the METRO Group, Studio Aisslinger and many more. Watly launched with the mission to develop the world’s most advanced solarwater treatment plant, including a micro-power station. The aim is to provide people around the world access to clean water, sanitation, energy and connectivity. The startup is already featured in a documentary that has been filmed by the Discovery Channel. AudioTube is a digital distribution company unlocking the true value of music in the digital age. Audiotube enables artists to automatically distribute their music to services such as Google Play, YouTube, RDIO, Spotify and is currently developing the API’s for 20 other Global Digital Service Providers. That way the reach of the songs is significantly increased. The founders of the London based company are experts in the music industry themselves, among them is a former manager at Warner Music. MYCHOPCHOP is a dynamic learning & task management app for cooking of more than one course meals. The app translates how an experienced chef plans and cooks multiple dishes efficiently and replicates the experience of being personally guided by a professional chef in the home kitchen. The female founder of this startup was an employee of McKinsey. ChangeAlert built a sensor for continence pads, which alerts on a web platform when the pad needs changing. The Spanish team led by founder Monica Rodriguez completed a round with the Wayra accelerator programme of Telefonica in London and is situated in the UK. Furthermore, they are also in a pilot project with the National Health Service (the National Health System of Great Britain). DooWapp is a music messaging technology that lets you add playable song lyrics to any part of your message, tweet or post to express yourself better. The founding trio is originally from Ghana and went through the last Wayra accelerator programme of Telefonica in London. RezGuru digitizes restaurants and allows them to market their availability across multiple online channels in real-time using revenue management strategies through flexible pricing in addition to a powerful analytics tools. The founders behind this Startup are two siblings from India, whom are already active in the Silicon Valley. Pico is the first real-time engagement tool for brands. Pico collects the pictures taken by a brand’s fans during a live event, such as a sports game or a concert, into one collaborative, real-time photo album directly on the brand’s Facebook page. The three founders from Tel Aviv have been part of the Startupbootcamp Israel accelerator programme and DreamIT in Philadelphia. Fitfully’s 3D Virtual-Fit-as-a-Service platform enables online consumers to virtually try on shoes they intend to purchase. The founder Batia Mach- Shepherd from Israel, will fix the shoe return challenges which many of the retail stores are facing from online orders.